No, I’m not trying to say that making mistakes is bad, or that we should all be perfect musicians who never miss a note, or anything along those lines. I’ll illustrate what I mean with a story from a lesson last week. These mistakes, and their accompanying “oopses”, were repeated both times she played the piece (it had a built-in repeat, so really I ended up hearing each “oops” four times.) It was obvious that each of the three mistakes was a hard-wired habit that she would need to deliberately eliminate in order to perfect the piece. When Nina finished playing, she turned to me expectantly. “Well,” I said, “there’s a few spots we’re going to need to fix before you pass this. There’s something even more important I want to change first, though – your “oopses.”” She looked surprised. “Every time you make a mistake you say “oops” – the problem is that none of these are real oopses. They happen every time! Nina nodded, and I pointed to the first “Oops” on the score – the first-to-second page transition. “Play from here -” I pointed two measures before the transition – “to here.” Two measures after. How long had the entire process taken? No more than ten minutes. Part of the really insidious nature of the Oops Trap is that, on one level, we’re right when we say “Oops” – and we know it! I did know that that note was supposed to be a C, instead of a D, and that I need to move my hand down to reach it. It was just a lapse of concentration. I could hit it, if I really put my mind to it. The problem with just saying “Oops” and moving on, of course, is that there’s no guarantee I’m not going to do exactly the same thing next time – as soon as I let my mind drift and my fingers go their habitual way. And just acknowledging that something is possible, in theory, doesn’t provide even the slightest step towards actually, physically making it happen. Inherent in the discipline of being a concert performer is the fact that one is forced to confront the Oopses. One finally learns, after years of hard (sometimes painful) experience, that they are not going to go away unless you really tackle them. Once learned, an Oops hunkers down, sinks in its teeth and stays firmly put, despite one’s best efforts to gloss over it and pretend it’s magically gone away this time. (It hasn’t – and more often than not it’ll rear its ugly head at your next lesson, or worse, on stage.) There is only one way to exorcise the Oopses, and that is through very careful, thoughtful, creative practice. The sad part is that most students waste far more time and energy ignoring the Oopses than it would take to just sit down and tackle them. In his article “What it Takes to Be Great,” Geoff Calvin discusses the ten thousand hour theory – how researchers have found that it isn’t innate “talent” or “aptitude” that leads to success, but rather hour after hour, year after year, of persistent practice. But not just any kind of practice is required – rather, one needs to engage in deliberate practice, to calmly and objectively recognize mistakes, learn from them and then eliminate them. This goes for any field of endeavor, from piano to golf to computer programming. The Oops Trap short-circuits this process. It keeps us indefinitely at square one. If we cover each of our mistakes with an hasty “Oops” and just blunder on ahead rather than learning from them, how can we possibly engage in deliberate practice? If it weren’t for the Oops Trap, I fully believe each of us could be a master of our chosen field, whatever that might be. Of course – and let’s all be honest here – it isn’t just music students that do this, or even golfers or computer programmers. It’s all of us. I’m as bad as anyone in my own way. I’ll admit it. A big one for me is my cell phone bill – it’s always due just slightly after mid-month, at a time that’s eminently forgettable. I put it on my desk, I make a mental note, I say to myself, “I really need to be sure to pay my cell phone bill on time THIS month.” And somehow…I’m not quite sure how…it always ends up getting paid a day or two late. And then there’s my seiza practice (sitting in a kneeling position) for aikido. I know I need to practice this – it doesn’t come easily to me. I know that I won’t get better at it, long-term, if I don’t put in the effort. Same goes for getting to bed before midnight. I know I should be doing it. I know it’s only hurting me not to. But somehow, the day goes by and suddenly it’s 11:59 at night and, well…oops. It’s frequently said that the definition of insanity is “doing the same thing and expecting different results.” It’s easy to identify the Oops Trap when we see a kid who repeatedly refuses to tackle the hard part in their piano piece, or somehow always stays up late scrambling to finish school projects the night before. Harder to recognize it and admit that it’s there in our own lives. Some Oopses – a very few – are genuine. We’re only human, and even the most conscientious of us can have things slip our mind, like a finger slip in an otherwise flawless performance by a concert pianist. We can have a bad day and snap at a friend, or get sick and decide to stay home from the gym, or forget to pay a bill…once. But when we find ourselves doing the same self-destructive thing, day after day, week after week, year after year, this isn’t a passing mistake; it’s a habit. And like all habits, it won’t go away unless we make a very planned, deliberate and intelligently designed effort in the opposite direction. A famous saying is that “the road to hell is paved with good intentions”. This often gets interpreted (rather cynically) as saying that if we go into a situation meaning well but not knowing what we’re doing, we can really mess things up. Which may be true, but it overshadows another important interpretation: the road to hell is paved with good intentions. Just intentions. With nothing to back them up, no plan to put them into action, intentions alone are going to get us nowhere – or worse. (Just ask any unprepared concert pianist who suddenly finds himself or herself on stage not fully knowing the music…a pretty good definition of Hell as far as I’m concerned!) Intentions lull us into a dangerous slumber. They make us think that we’ve done something, that the danger is gone. (It isn’t.) 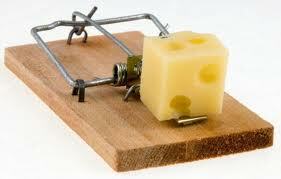 Intentions are no substitute for action, and action is the only way out of the Oops Trap. The other really sneaky aspect of the Oops Trap is that it’s so ubiquitous, hiding in one aspect of our lives after another, yet appearing entirely different each time. We find it in piece after musical piece, project after project, job after job (believers in reincarnation would even say “life after life”) and every exercise regimen or relationship or self improvement goal we attempt. Until finally we bite the bullet, look reality in the eye, and acknowledge all our Oops-ing itself as one big meta-Oops Trap, a destructive habit, a strategy doomed to fail from the start – and finally remove it from our lives. …Well, that’s what I’m hoping, anyway. 😉 I’m still trying to pay my cell phone bill on time. P.S. And as I wrote that last sentence, my mind went to a piano lesson last year, in which a student protested that he was “trying” to get the rhythm right in a particular passage. As he’s a Star Wars fan, I asked him what Yoda’s favorite expression was. “Do, or do not. There is no try,” he quoted. “Trying” can be an incarnation of the Oops Trap, as much as anything else. So can “resolutions” (especially, New Year’s resolutions…seriously, who here has actually kept one of those??) So, I’m not going to “try” to pay my cell phone bill on time. Iam going to pay it on time. And I just took steps to make that happen. Another small victory over the Oops Trap.